The arcade is now home to a variety of shops, restaurants and other businesses. WHAT makes a building of heritage significance? 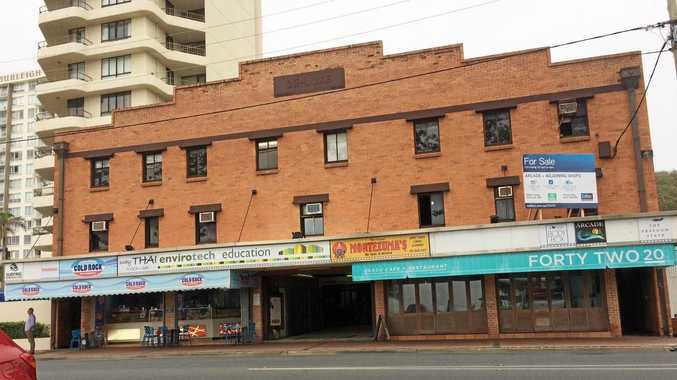 That's the question many are asking following news that the Old Burleigh Theatre Arcade is for sale after 45 years and, given its prime position opposite the beach, likely to be redeveloped. Starting life as a movie theatre and dance hall, the De-Luxe was opened by William Fradgley in 1930, and the red-brick building is a Burleigh landmark, with numerous people taking to Facebook sharing memories and calling for it to be saved. It is on the market via expressions of interest, together with the adjoining single-storey building at 1823 Gold Coast Highway (including a café, barber and Mexican takeaway). Joint selling agent, Steven King from Colliers International, told the Courier Mail the Goodwin Terrace property was "an icon in the local community". The building was identified as of "historical and aesthetic significance" in Gold Coast City Council's 2010 Burleigh Heads Heritage and Character Study. According to the Council's Local Studies Library website, as well as showing movies under William Fradgley's ownership, the De-Luxe was "the venue of balls, dances, celebrations, singing, meetings of local organisations, roller skating competitions and indoor sports such as hockey", as well as church services. 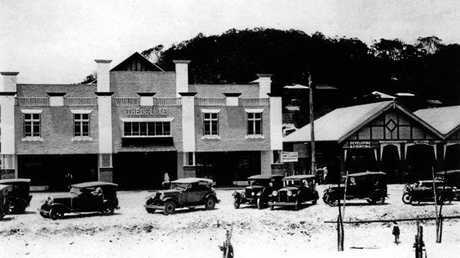 In December 1930 it hosted the Burleigh Progress Association and Nerang Shire Council dance and euchre party "to celebrate the switching on of electric lighting in Burleigh Heads". During World War II, after the establishment of local Australian and American army convalescent camps, films were shown seven days a week, instead of just twice a week. Thams Brothers ran the De-Luxe from February 1945, and retained it until about 1970. According to Council's 2010 study, "The theatre changed ownership in 1947 and again in 1969, with substantial alterations undertaken in 1980 that saw the removal of the interior and conversion of the theatre to retail space. "The Deluxe Theatre is today known as the Old Burleigh Theatre Arcade, and is recognised as a landmark feature of Burleigh Heads." Beverley Elliot remembers attending movies at the De-Luxe in its heyday in the late 1940s-50s, including Sons of Matthew, which celebrated its 70th birthday this year with a screening at HOTA. "They had the slingback canvas seats and it was very popular - that was the days before television," she said. "We would go a lot to the Saturday matinee and it was a very tough decision when the concrete skating rink was built across the road which one to go to." Stephen Fleay worked there as a schoolboy in 1958-59 assisting the projectionist Mr Dowd to thread movies, and dreams of the theatre being restored and re-imagined as The New Deluxe and showing films again. He recalls lugging the heavy 35mm films up two flights of steep steps, with a B-grade movie followed by an interval before the main attraction, featuring stars like Peter Sellers. He explained that the new front and back of the building were added in 1955 to repair damage from the cyclone of 1954 (although the theatre operated as a 'semi-open-air' venue four days after the storm) and to allow installation of widescreen CinemaScope movies with stereophonic sound. Both the front and back of the building were holiday flats - hence the number of windows on the façade. It is this new addition, plus its change of use to a retail and commercial arcade which cause confusion in knowing if and how the building should be conserved. The Burleigh Heads Heritage and Character Study notes: "Character is often linked to the history and heritage of a place, and is what gives a place its identity". It further states: "The best way to protect these places is to ensure they remain in use and are valued by the community". "Consider inclusion of all identified local heritage places in the local heritage register maintained by GCCC and inclusion of a heritage schedule within the Burleigh and Burleigh Heads LAPs, and formal adoption by GCCC ...."
But the theatre is not heritage listed. Architect Jacqueline Pearce is Gold Coast Open House chair and has over 20 years' experience in heritage and conservation services in Australia. She fully supports the City of Gold Coast considering inclusion of additional buildings on its heritage register to give them a level of protection, but admits the register "is not well populated with all the buildings that could be on it". While alterations to the original De-Luxe potentially detract from the building's significance, she said it was necessary to establish carefully what was significant. "Heritage is inherent: whether a building is on a list or not," she said. "I certainly strongly support further investigations to identify what is of heritage importance and then to protect any established elements of significance." Both Jacqueline and fellow architect Philip Follent pointed to the possibility of "adaptive reuse" in keeping with the building's history, or inclusion of elements of that history in any new development, as in the case of The Pink Poodle. Council's Local Studies Library website, go to goldcoaststories.com.au.